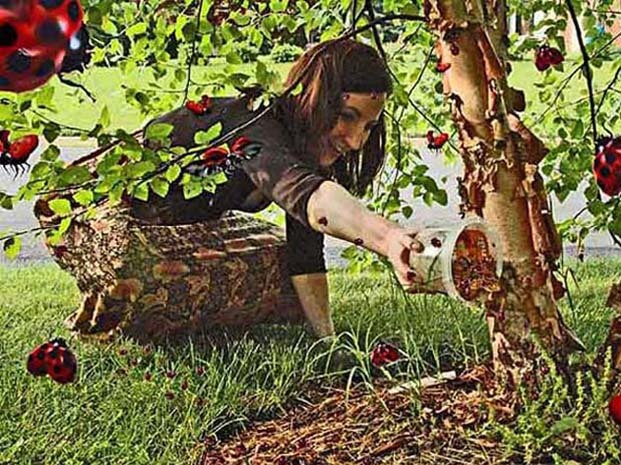 Composite created in 2010 as a gift to this helping professional, who is shown scattering ladybugs at the foot of a birch tree. The little red beetles, and their offspring hatched within days, will annihilate a vast colony of aphids that had gummed up and withered many leaves of this birch. Ladybugs have earned far more adulation than most insects ever get. “People dedicated the bug to the Virgin Mary and called it The Bug of Our Lady,” which led to its name, according to one insect procurer. For a penny per bug, you can buy a bag of 1,500 by mail.